When it is none of your business. Busy bodies abound in every culture. Everywhere there are people who want to tell other people how to live their lives. You don’t want to let them get you worked up. It is best to keep a cool head. Some people will even be offended that you won’t take their advice. (however), (if) (you) (keep) (-ing) (smile) (you) (will) (to feel) (best). However, if you keep smiling you will feel best. What is good for you is not necessarily good for me. Possibly, it could help to say it from their perspective. Don’t you want to live the life you want to? Most people want to live their own lives feeling free. 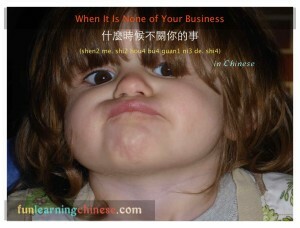 ❷ 不過 (bu2 guo4), as mentioned in note ❶, can be used fairly interchangeably with 可是 (ke3 shi4) and 但是 (dan4 shi4). ❸ 關 (guan1) is also the character that means “to shut or close,” as in closing a door or switching off a light. However, another of it’s meanings is as given above. 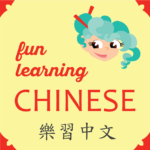 ❹ 少 (shao3) has been most commonly shown to me to mean “small in number,” as in the shopping question: 多少錢？ (duo1 shao3 qian2) “lots (or) little money?”, a sentence meaning “How much does it cost?” Like many characters, or English words, there are several possible meanings, often discovered by context of usage. ❺You may notice hear that another “guan” is being used in a phrase of very similar meaning. The two characters have unconnected meanings, but happen to be part of phrases with similar meaning. They do have different tones, too. ❻ While “Keep your nose out of it” is not the literal translation of the sentence, it is the common English turn of phrase that is similar in force of meaning. ❼ The sentence structure here is 你不想過。。。生活嗎？Or in English: Don’t you want to live … life? The space could be filled with anything to describe the kind of life you think someone would want to live such as the following examples, adding the (de.) as necessary to signify an adjective.